Denver International Airport is one of the busiest airports in the world, with more than 50 million passengers traveling though each year. 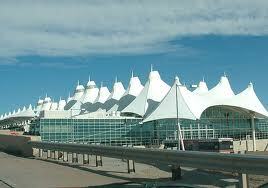 Denver International Airport is major airport located in Denver, Colorado, United States and serves domestic and international flights to 824 different destinations, connecting Denver, Colorado with North America, Europe, Asia, South America and Oceania. The most popular destinations to fly to from Airport are Los Angeles, Chicago O'Hare International Airport, Salt Lake City International Airport, San Francisco and Atlanta . The longest flight you can take is to Narita International Airport (11:50 hours) . Carriers such as Southwest Airlines, United Airlines and Air Canada have regular flights to and from Airport. It is also an international/domestic hub for United Airlines .